Objective: Parkinson’s disease (PD) is a progressive neurological disorder characterised by a large number of motor and non-motor features that can impact on function to a variable degree. This review describes the clinical characteristics of PD with emphasis on those features that differentiate the disease from other parkinsonian disorders. Methods: A MedLine search was performed to identify studies that assess the clinical characteristics of PD. Search terms included “Parkinson’s disease”, “diagnosis” and “signs and symptoms”. Results: Because there is no definitive test for the diagnosis of PD, the disease must be diagnosed based on clinical criteria. Rest tremor, bradykinesia, rigidity and loss of postural reflexes are generally considered the cardinal signs of PD. The presence and specific presentation of these features are used to differentiate PD from related parkinsonian disorders. Other clinical features include secondary motor symptoms (eg, hypomimia, dysarthria, dysphagia, sialorrhoea, micrographia, shuffling gait, festination, freezing, dystonia, glabellar reflexes), non-motor symptoms (eg, autonomic dysfunction, cognitive/neurobehavioral abnormalities, sleep disorders and sensory abnormalities such as anosmia, paresthesias and pain). Absence of rest tremor, early occurrence of gait difficulty, postural instability, dementia, hallucinations, and the presence of dysautonomia, ophthalmoparesis, ataxia and other atypical features, coupled with poor or no response to levodopa, suggest diagnoses other than PD. Conclusions: A thorough understanding of the broad spectrum of clinical manifestations of PD is essential to the proper diagnosis of the disease. Genetic mutations or variants, neuroimaging abnormalities and other tests are potential biomarkers that may improve diagnosis and allow the identification of persons at risk. In his 1817 “An essay on the shaking palsy”, James Parkinson first described the clinical syndrome that was later to bear his name.1 He identified six cases, three of whom he personally examined; three he observed on the streets of London. Previously referred to as “paralysis agitans”, Charcot later in the 19th century gave credit to Parkinson by referring to the disease as “maladie de Parkinson” or Parkinson’s disease (PD). Charcot also recognised non-tremulous forms of PD and correctly pointed out that slowness of movement should be distinguished from weakness or “lessened muscular power”, a term originally used by Parkinson.2 More than 100 years passed (1919) after the original description by Parkinson before it was recognised that patients with PD lose cells in the substantia nigra, and 140 years passed (1957) before dopamine was discovered as a putative neurotransmitter by Carlsson and colleagues in Lund, Sweden.3 The discovery by Ehringer and Hornykiewicz in 19603 4 that dopamine concentrations are markedly decreased in the striatum of patients with PD paved the way for the first trials of levodopa in PD patients the following year5 and subsequent award of the Nobel Prize in Medicine to Carlsson in 2000. The ability of injected levodopa to improve akinesia in patients with PD was first demonstrated in 1961 and was followed by the development of oral levodopa later in the decade.6 7 More recently, genetic mutations, abnormal handling of misfolded proteins by the ubiquitin–proteasome and the autophagy–lysosomal systems, increased oxidative stress, mitochondrial dysfunction, inflammation and other pathogenic mechanisms have been identified as contributing factors in the death of dopaminergic and non-dopaminergic cells in the brains of patients with PD.8 9 It is beyond the scope of this review to discuss the various pathogenic mechanisms, management or treatment related complications that have been the subjects of recent reviews and volumes.10 11 This article focuses on the clinical features of PD and the differentiation of the disease from other parkinsonian disorders. A number of rating scales are used for the evaluation of motor impairment and disability in patients with PD, but most of these scales have not been fully evaluated for validity and reliability.13 14 The Hoehn and Yahr scale is commonly used to compare groups of patients and to provide gross assessment of disease progression, ranging from stage 0 (no signs of disease) to stage 5 (wheelchair bound or bedridden unless assisted). The Unified Parkinson’s Disease Rating scale (UPDRS) is the most well established scale for assessing disability and impairment.13 15 Studies making use of UPDRS to track the progression of PD suggest that the course of PD is not linear and that the rate of deterioration is variable and more rapid in the early phase of the disease and in patients with the postural instability gait difficulty (PIGD) of PD.16–18 We prospectively followed-up 297 patients (181 men, 116 women) with clinically diagnosed PD for at least 3 years and, based on data from 1731 visits during an average of 6.36 years (range 3–17), we concluded that the annual rate of decline in the total UPDRS scores was 1.34 points when assessed during ON and 1.58 points when assessed during OFF. Patients who were older and had the PIGD form of PD at onset experienced more rapid disease progression than did those who were younger at onset and had the tremor dominant form of PD. Furthermore, the older group experienced significantly more progression in mentation, freezing and parts I and II UPDRS subscores. Handwriting was the only component of the UPDRS that did not significantly deteriorate during the observation period. On the other hand, many studies have shown that younger patients are at a higher risk for levodopa induced dyskinesias than older patients.19 In a prospective study of 145 clinic based patients followed-up for 1 year and of 124 community based patients followed-up for 4 years, the annual mean rate of deterioration in motor and disability scores ranged from 2.4% to 7.4%.20 The current UPDRS is undergoing revisions so that the revised scale will be more sensitive to detect small changes and it will integrate non-motor elements of PD.15 Other types of rating scales include those that assess psychiatric manifestations (eg, depression)21 and quality of life.14 21 The most frequent clinical features associated with PD are listed in table 1 and are discussed in the following sections. Bradykinesia refers to slowness of movement and is the most characteristic clinical feature of PD, although it may also be seen in other disorders, including depression. Bradykinesia is a hallmark of basal ganglia disorders, and it encompasses difficulties with planning, initiating and executing movement and with performing sequential and simultaneous tasks.22 The initial manifestation is often slowness in performing activities of daily living and slow movement and reaction times.23 24 This may include difficulties with tasks requiring fine motor control (eg, buttoning, using utensils). Other manifestations of bradykinesia include loss of spontaneous movements and gesturing, drooling because of impaired swallowing,25 monotonic and hypophonic dysarthria, loss of facial expression (hypomimia) and decreased blinking, and reduced arm swing while walking. Given that bradykinesia is one of the most easily recognisable symptoms of PD, it may become apparent before any formal neurological examination. Assessment of bradykinesia usually includes having patients perform rapid, repetitive, alternating movements of the hand (finger taps, hand grips, hand pronation–supination) and heel taps and observing not only slowness but also decrementing amplitude. In common with other parkinsonian symptoms, bradykinesia is dependent on the emotional state of the patient. For example, immobile patients who become excited may be able to make quick movements such as catching a ball (or may be able to suddenly run if someone screams “fire”). This phenomenon (kinesia paradoxica) suggests that patients with PD have intact motor programmes but have difficulties accessing them without an external trigger, such as a loud noise, marching music or a visual cue requiring them to step over an obstacle. It is hypothesised that bradykinesia is the result of a disruption in normal motor cortex activity mediated by reduced dopaminergic function. In a study assessing recordings from single cortical neurons in rats with haloperidol induced bradykinesia, a decrease in firing rates correlated with bradykinesia.29 Functional neuroimaging studies also suggest impairment in the recruitment of cortical and subcortical systems that regulate kinematic parameters of movement (eg, velocity).30 Conversely, recruitment of various premotor areas, such as those responsible for visuomotor control, is increased.30 Anatomically, the deficit appears to be localised in the putamen and globus pallidus,28 resulting in a reduction in the muscle force produced at the initiation of movement. Analysis of electromyographic recordings showed that patients with bradykinesia are unable to energise the appropriate muscles to provide enough force to initiate and maintain large fast movements.31 Because patients with PD have decreased electromyographic activity,22 they need a series of multiple agonist bursts to accomplish larger movements. Rest tremor is the most common and easily recognised symptom of PD. Tremors are unilateral, occur at a frequency between 4 and 6 Hz, and almost always are prominent in the distal part of an extremity. Hand tremors are described as supination–pronation (“pill-rolling”) tremors that spread from one hand to the other. Rest tremor in patients with PD can also involve the lips, chin, jaw and legs but, unlike essential tremor, rarely involves the neck/head or voice. Thus a patient who presents with head tremor most likely has essential tremor, cervical dystonia, or both, rather than PD. Characteristically, rest tremor disappears with action and during sleep. Some patients also report an “internal” shaking that is not associated with a visible tremor.32 The tremor of PD is differentiated from that of essential tremor by a number of features (table 2). In addition to rest tremor, many patients with PD also have postural tremor that is more prominent and disabling than rest tremor and may be the first manifestation of the disease.34 35 Parkinson’s related postural tremor (“re-emergent tremor”) is differentiated from essential tremor in that the appearance of tremor is often delayed after the patient assumes an outstretched horizontal position.34 Because re-emergent tremor occurs at the same frequency as classical rest tremor and is responsive to dopaminergic therapy, it is likely that it represents a variant of the more typical rest tremor. There are several clues to the diagnosis of existent essential tremor when it coexists with PD, including longstanding history of action tremor, family history of tremor, head and voice tremor, and no latency when arms are outstretched in a horizontal position in front of the body, although some patients may also have a re-emergent tremor related to their PD, tremulous handwriting and spiral, and improvement of the tremor with alcohol and beta-blockers. The occurrence of rest tremor is variable among patients and during the course of the disease. In one study, Hughes and colleagues36 reported that 69% of patients with PD had rest tremor at disease onset and that 75% had tremor during the course of their disease. Tremor was lost in 9% of patients late in the disease. Others have reported that a small proportion of patients (11%) never have tremor,37 although a prospective study in patients with autopsy proven disease found that 100% of patients had tremor at some point.38 Clinical–pathological studies have demonstrated that patients with PD and prominent tremor have degeneration of a subgroup of midbrain (A8) neurons, whereas this area is spared in PD patients without tremor. Rigidity is characterised by increased resistance, usually accompanied by the “cogwheel” phenomenon, particularly when associated with an underlying tremor, present throughout the range of passive movement of a limb (flexion, extension or rotation about a joint). It may occur proximally (eg, neck, shoulders, hips) and distally (eg, wrists, ankles). Reinforcing manoeuvres (eg, voluntary movements of the contralateral limb), known as the Froment’s manoeuvre,39 usually increase rigidity and are particularly useful in detecting mild cases of rigidity. Rigidity may be associated with pain, and painful shoulder is one of the most frequent initial manifestations of PD although it is commonly misdiagnosed as arthritis, bursitis or rotator cuff injury.40 41 A prospective study of 6038 persons (mean age 68.5 years) with no evidence of dementia or parkinsonism at baseline found that the presence of stiffness, tremor and imbalance were each associated with increased risk for PD (hazard ratios 2.11, 2.09 and 3.47, respectively).42 Among this cohort, 56 new cases of PD were identified over a mean follow-up of 5.8 years. Figure 1 Striatal hand (A) and foot (B) deformity in a patient with typical Parkinson’s disease. Patient consent has been received to publish this figure. 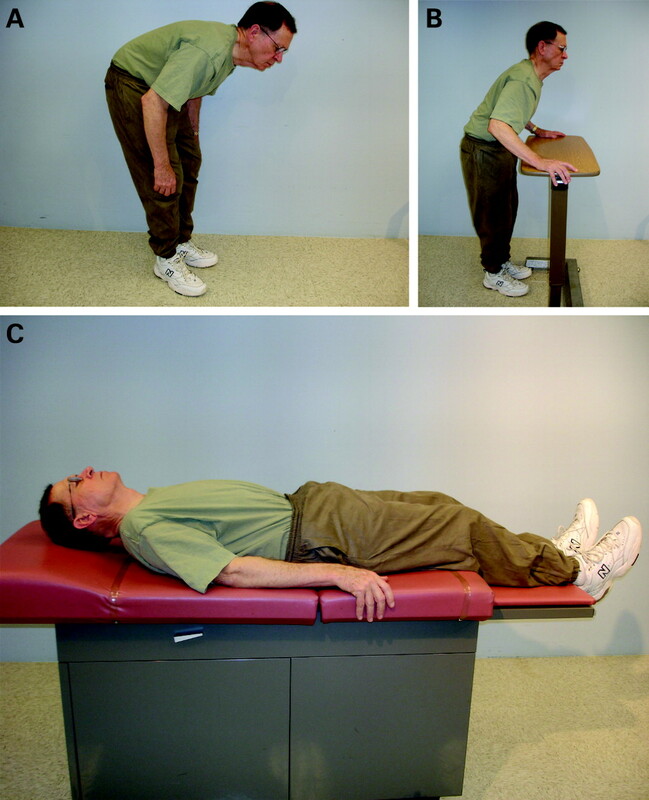 Figure 2 Camptocormia in a patient with Parkinson’s disease manifested by flexion of the trunk (A) which the patient can correct by pushing himself into extension posture (B) or by lying in a supine position (C). Patient consent has been received to publish this figure. Non-motor symptoms are a common and under appreciated feature of PD.92 These include autonomic dysfunction, cognitive/neurobehavioral disorders, and sensory and sleep abnormalities. Sensory symptoms such as olfactory dysfunction, pain, paresthesia, akathisia, oral pain and genital pain are frequent but are often not recognised as parkinsonian symptoms.41 116–121 One study found that olfactory dysfunction (hyposmia) may be an early marker of PD; it correlated with a 10% increased risk for the disease 2 years later compared with other asymptomatic relatives.122 A study involving 62 pairs of twins discordant for PD found that smell identification was reduced in twins affected with PD than in those who were asymptomatic.123 It has been postulated that olfactory dysfunction is related to either neuronal loss in the corticomedial amygdala124 or to decreased dopaminergic neurons in the olfactory bulb. A study evaluating 800 patients from the DATATOP trial suggested that movement disorder specialists are skilful at diagnosing PD.132 In this study, patients were followed-up from early pretreatment stages for a mean of 7.6 years. Based on autopsy data, imaging studies, response to levodopa and atypical clinical features, only 8.1% of patients did not meet the diagnostic criteria at the final diagnosis. Although this represents an improvement in diagnostic accuracy over earlier studies, it must be noted that not all diagnoses were confirmed on pathological examination. Neuroimaging techniques may also be useful for differentiating PD from other parkinsonian disorders.139 Potential imaging studies include high field strength (1.5 T) heavily T2 weighted MRI,139 [18F]-fluorodopa positron emission tomography,139 [11C]-raclopride imaging of dopamine D2 receptors140 and single photon emission computed tomography of striatal dopamine reuptake sites.141 One study suggested that brain parenchyma sonography may be highly specific for differentiating between PD and atypical parkinsonism142; however, it also showed abnormal hyperechogenicity not only in PD but in essential tremor.143 Although these neuroimaging techniques are promising, further refinement in resolution and improvement in sensitivity are needed before their diagnostic potential is fully realised. PD is a progressive neurodegenerative disorder manifested by a broad spectrum of motor and non-motor features. The natural progression of PD is variable but is usually more rapid in patients with late onset and with the PIGD form of PD. In a comprehensive review of the literature, the standardised mortality ratio has been reported to range between 1 and 3.4.144 Because there are no definitive diagnostic tests for it, clinicians require thorough knowledge of the clinical manifestations of PD to aid them in differentiating it from related disorders. Future research may uncover disease specific biomarkers allowing for its differentiation from other neurodegenerative disorders. Not only will such testing be useful for diagnosing the disease in affected persons, it will be useful for identifying family members or populations at risk, thus providing an opportunity to initiate neuroprotective therapy at an asymptomatic stage. I would like to thank the National Parkinson Foundation for its support of our NPF Center of Excellence and Susan Quiñones, PhD for editorial assistance.
. An essay on the shaking palsy. J Neuropsychiatry Clin Neurosci 2002;14:223–36.
. A new look at James Parkinson’s essay on the shaking palsy. Neurology 2007;69:482–5.
. Dopamine neuron systems in the brain: an update. Trends Neurosci 2007;30:194–202.
. The discovery of dopamine deficiency in the parkinsonian brain. J Neural Transm 2006;70:9–15.
. The L-3,4-dioxyphenylalanine (DOPA)-effect in Parkinson-akinesia. Wien Klin Wochenschr 1961;73:787–8.
. The effect of L-3, 4-dihydroxyphenylalanine (L-DOPA) on akinesia in parkinsonism. Parkinsonism Relat Disord 1998;4:59–60.
. Modification of parkinsonism: chronic treatment with L-DOPA. N Engl J Med 1969;280:337–45.
. Protein mishandling: Role of the ubiquitin proteasome system in the pathogenesis of Parkinson’s disease. In: Jankovic J, Tolosa E, eds. Parkinson’s disease and movement disorders. Philadelphia: Lippincott Williams and Wilkins, 2007:33–49.
. The role of autophagy-lysosome pathway in neurodegeneration associated with Parkinson's disease. Brain 2008 (Epub ahead of print).
. Parkinson’s disease and movement disorders. Philadelphia: Lippincott Williams and Wilkins, 2007.
. Principles and practice of movement disorders. Philadelphia: Elsevier, 2007.
. Pathophysiology and assessment of parkinsonian symptoms and signs. In: Pahwa R, Lyons K, Koller WC, eds. Handbook of Parkinson’s disease. New York: Taylor and Francis Group, LLC, 2007:79–104.
. Systematic evaluation of rating scales for impairment and disability in Parkinson’s disease. Mov Disord 2002;17:867–76.
. Scales in Parkinson’s disease. J Neurol 2006;253:iv32–5.
. Movement Disorder Society-sponsored revision of the Unified Parkinson’s Disease Rating Scale (MDS-UPDRS): process, format, and clinimetric testing plan. Mov Disord 2007;22:41–7.
. Functional decline in Parkinson disease. Arch Neurol 2001;58:1611–5.
. The progression of Parkinson disease: a hypothesis. Neurology 2007;68:948–52.
. Prognostic factors for the progression of Parkinson's disease: A systematic review. Mov Disord 2007;22:1839–51.
. Medical management of levodopa-associated motor complications in patients with Parkinson’s disease. CNS Drugs 2007;21:677–92.
. Rate of clinical progression in Parkinson’s disease. A prospective study. Mov Disord 2007;22:938–45.
. Depression rating scales in Parkinson’s disease: critique and recommendations. Mov Disord 2007;22:1077–92.
. Pathophysiology of bradykinesia in Parkinson’s disease. Brain 2001;124:2131–46.
. Slowed central processing in simple and go/no-go reaction time tasks in Parkinson’s disease. Brain 1994;117:517–29.
. Bradykinesia akinesia inco-ordination test (BRAIN TEST): an objective computerised assessment of upper limb motor function. J Neurol Neurosurg Psychiatry 1999;67:624–9.
. A study of salivary secretion in Parkinson’s disease. Clin Neuropharmacol 1999;22:213–15.
. Which clinical sign of Parkinson’s disease best reflects the nigrostriatal lesion? Ann Neurol 1997;41:58–64.
. Parkinsonian signs and substantia nigra neuron density in decendents elders without PD. Ann Neurol 2004;56:532–9.
. The metabolic substrates of bradykinesia and tremor in uncomplicated Parkinson’s disease. Neuroimage 2002;17:688–99.
. Bradykinesia induced by dopamine D2 receptor blockade is associated with reduced motor cortex activity in the rat. J Neurosci 2005;25:5700–9.
. The functional anatomy of parkinsonian bradykinesia. Neuroimage 2003;19:163–79.
. A physiological mechanism of bradykinesia. Brain 1980;103:301–14.
. Internal tremor in patients with Parkinson’s disease. Mov Disord 1996;11:3–7.
. Exploring the relationship between essential tremor and Parkinson’s disease. Parkinsonism Relat Disord 2007;13:67–76.
. Re-emergent tremor of Parkinson’s disease. J Neurol Neurosurg Psychiatry 1999;67:646–50.
. Essential tremor: a heterogenous disorder. Mov Disord 2002;17:638–44.
. A clinicopathologic study of 100 cases of Parkinson’s disease. Arch Neurol 1993;50:140–8.
. Parkinson’s disease: clinical analysis of 100 patients. Neurology 1973;23:783–90.
. Accuracy of clinical diagnosis in parkinsonism: a prospective study. Can J Neurol Sci 1991;18:275–8.
. Contribution of Jules Froment to the study of parkinsonian rigidity. Mov Disord 2007;22:909–14.
. Frozen shoulder and other shoulder disturbances in Parkinson’s disease. J Neurol Neurosurg Psychiatry 1989;52:63–6.
. Shoulder pain in Parkinson’s disease. Mov Disord 2007;22:S247–8.
. Subjective complaints precede Parkinson disease: the Rotterdam study. Arch Neurol 2006;63:362–5.
. Striatal deformities of the hand and foot in Parkinson’s disease. Lancet Neurol 2005;4:423–31.
. Joint and skeletal deformities in Parkinson’s disease, multiple system atrophy, and progressive supranuclear palsy. Mov Disord 2006;21:1856–63.
. The frequency and significance of ‘striatal toe’ in parkinsonism. Parkinsonism Relat Disord 2002;9:97–101.
. Parkinsonism and neck extensor myopathy: a new syndrome or coincidental findings? Arch Neurol 2001;58:232–7.
. Camptocormia in Parkinson’s disease: new insights. J Neurol Neurosurg Psychiatry 2006;77:1205.
. Camptocormia: pathogenesis, classification, and response to therapy. Neurology 2005;65:355–9.
. Parkinson’s disease with camptocormia. J Neurol Neurosurg Psychiatry 2006;77:1223–8.
. Camptocormia (bent spine) in patients with Parkinson’s disease—characterization and possible pathogenesis of an unusual phenomenon. Mov Disord 1999;14:443–7.
. Cholinergic-dopaminergic imbalance in Pisa syndrome. Clin Neuropharmacol 2003;26:119–21.
. Predictors of falls and fractures in bradykinetic rigid syndromes: a retrospective study. J Neurol Neurosurg Psychiatry 2006;77:468–73.
. Progression of falls in postmortem-confirmed parkinsonian disorders. Mov Disord 1999;14:947–50.
. Postural instability in Parkinson’s disease. Clin Neurol Neurosurg 1992;94:S41–5.
. Postural instability in idiopathic Parkinson’s disease: the role of medication and unilateral pallidotomy. Brain 2002;125:2100–14.
. Fear of falling and postural control in Parkinson’s disease. Mov Disord 2003;18:496–502.
. Falls and Parkinson’s disease. Clin Neuropharmacol 1989;12:98–105.
. Postural control in Parkinson’s disease after unilateral posteroventral pallidotomy. Brain 2000;123:2141–9.
. Effect of chronic bilateral subthalamic nucleus (STN) stimulation on postural control in Parkinson’s disease. Brain 2003;126:1146–63.
. Bilateral deep brain stimulation of the pedunculopontine and subthalamic nuclei in severe Parkinson’s disease. Brain 2007;130:1596–607.
. Freezing of gait in PD: prospective assessment in the DATATOP cohort. Neurology 2001;56:1712–21.
. Falls and freezing of gait in Parkinson’s disease: a review of two interconnected, episodic phenomena. Mov Disord 2004;19:871–84.
. Predictors of freezing in Parkinson’s disease: a survey of 6,620 patients. Mov Disord 2007;22:953–6.
. Apraxia of lid opening: a review. Neurology 1997;48:1491–4.
. Characterization of freezing of gait subtypes and the response of each to levodopa in Parkinson’s disease. Eur J Neurol 2003;10:391–8.
. Evaluation of a modified inverted walking stick as a treatment for parkinsonian freezing episodes. Mov Disord 1990;5:243–7.
. Effects of rhythmic sensory stimulation (auditory, visual) on gait in Parkinson's disease patients. Exp Brain Res 2008 (Epub ahead of print 23 Jan).
. The role of sensory cues in the rehabilitation of parkinsonian patients: a comparison of two physical therapy protocols. Mov Disord 2000;15:879–83.
. Freezing phenomenon in patients with parkinsonian syndromes. Mov Disord 1997;12:302–5.
. Botulinum toxin in the treatment of tremors, dystonias, sialorrhea and other symptoms associated with Parkinson’s disease. Exp Rev Neurother 2007;7:637–47.
. Parkinson’s disease and driving ability. J Neurol Neurosurg Psychiatry 2007;78:363–6.
. Blinking and the release reflexes: are they clinically useful? J Am Geriatr Soc 1994;42:609–13.
. Primitive reflexes in healthy, adult volunteers and neurological patients: methodological issues. J Neurol 1993;240:495–504.
. Glabellar and palmomental reflexes in Parkinsonian disorders. Neurology 2004;63:1096–8.
. The specificity and sensitivity of “applause sign” in differentiating PSP and other parkinsonian syndromes. Mov Disord 2007;22:S254–5.
. Interhemispheric and ipsilateral connections in Parkinson’s disease: relation to mirror movements. Mov Disord 2007;22:813–21.
. The relationship between parkinsonian rigidity and hypokinesia in the orofacial system: a quantitative analysis. Neurology 1982;32:749–54.
. “Tip-of-the-tongue” phenomenon in Parkinson disease. Neurology 1982;32:567–70.
. Speech disorders of Parkinsonism: a review. J Neurol Neurosurg Psychiatry 1981;44:751–8.
. Effects of intensive voice treatment (the Lee Silverman Voice Treatment [LSVT]) on vowel articulation in dysarthric individuals with idiopathic Parkinson disease: acoustic and perceptual findings. J Speech Lang Hear Res 2007;50:899–912.
. Swallowing disorders in Parkinson’s disease. Parkinsonism Relat Disord 2003;9:349–53.
. Ophthalmologic features of Parkinson’s disease. Neurology 2004;62:177–80.
. Levodopa slows prosaccades and improves antisaccades: an eye movement study in Parkinson’s disease. J Neurol Neurosurg Psychiatry 2007;78:565–70.
. Abnormal ocular movements in Parkinson’s disease: evidence for involvement of dopaminergic systems. Brain 1989;112:1193–214.
. Smooth pursuit during dose-related on-off fluctuations in Parkinson’s disease. Neurology 1987;37:1389–92.
. Apraxia in movement disorders. Brain 2005;128:1480–97.
. Levodopa-induced ocular dyskinesias in Parkinson’s disease. Mov Disord 2002;17:186–7.
. Obstructive and restrictive pulmonary dysfunctions in Parkinson’s disease. J Neurol Sci 1996;138:114–19.
. Predictors of mortality among nursing home residents with a diagnosis of Parkinson’s disease. Med Sci Monit 2002;8:CR241–6.
. Respiratory function in Parkinson’s disease. Clin Neurosci 1998;5:131–5.
. Respiratory dyskinesia in Parkinson’s disease. Neurology 1986;36:303–4.
. Nonmotor symptoms of Parkinson’s disease. Exp Rev Neurother 2006;6:1811–22.
. Sweating in Parkinsonian patients with wearing-off. Mov Disord 2007;22:828–32.
. Prevalence of orthostatic hypotension in Parkinson’s disease. J Neurol Neurosurg Psychiatry 1997;63:584–9.
. Sweating dysfunction in Parkinson’s disease. Mov Disord 2003;18:1459–63.
. Frequency of orthostatic hypotension in a community based cohort of patients with Parkinson’s disease. J Neurol Neurosurg Psychiatry 2004;75:1470–1.
. Sydney Multicenter Study of Parkinson’s disease: non-L-dopa-responsive problems dominate at 15 years. Mov Disord 2005;20:190–9.
. Risk of dementia in Parkinson’s disease: a community-based, prospective study. Neurology 2001;56:730–6.
. Neuropsychiatric symptoms in patients with Parkinson’s disease and dementia: frequency, profile and associated care giver stress. J Neurol Neurosurg Psychiatry 2007;78:36–42.
. The impact of depressive symptoms in early Parkinson disease. Neurology 2007;69:342–7.
. Is dopamine a physiologically relevant mediator of feeding behavior? Trends Neurosci 2007;30:375–81.
. Punding prevalence in Parkinson’s disease. Mov Disord 2007;22:1179–81.
. Association of dopamine agonist use with impulse control disorders in Parkinson disease. Arch Neurol 2006;63:969–73.
. Cognitive slowing in Parkinson disease is accompanied by hypofunctioning of the striatum. Neurology 2007;68:1062–8.
. Daytime sleepiness and other sleep disorders in Parkinson’s disease. Neurology 2001;57:1392–6.
. Excessive daytime sleepiness in Parkinson disease: is it the drugs or the disease? Neurology 2006;67:853–8.
. Delayed emergence of a parkinsonian disorder in 38% of 29 older men initially diagnosed with idiopathic rapid eye movement sleep behavior disorder. Neurology 1996;46:388–93.
. REM sleep behavior disorders in multiple system atrophy. Neurology 1997;48:1094–7.
. Rapid-eye-movement sleep behaviour disorder and neurodegenerative diseases. Lancet Neurol 2006;5:424–32.
. Phenomenology of dreams in Parkinson’s disease. Mov Disord 2007;22:198–202.
. Insomnia in Parkinson’s disease: frequency and progression over time. J Neurol Neurosurg Psychiatry 2007;78:476–9.
. Pathophysiology of REM sleep behaviour disorder and relevance to neurodegenerative disease. Brain 2007;130(Pt 11):2770–88.
. Hypocretin (orexin) loss in Parkinson’s disease. Brain 2007;130:1577–85.
. Hypocretin (orexin) cell loss in Parkinson’s disease. Brain 2007;130:1586–95.
. Fatigue in Parkinson’s disease: a review. Mov Disord 2007;22:297–308.
. Olfactory function in Parkinson’s disease subtypes. Neurology 1994;44:266–8.
. Correlation between cardiac 123I-MIBG and odor identification in patients with Parkinson’s disease and multiple system atrophy. Mov Disord 2006;21:1975–7.
. Akathisia in Parkinson’s disease. Mov Disord 1994;9:545–9.
. Oral and genital pain syndromes in Parkinson’s disease. Mov Disord 1996;11:421–6.
. Quantitative measurement of pain sensation in patients with Parkinson disease. Neurology 2004;62:2171–5.
. Pain and motor complications in Parkinson’s disease. J Neurol Neurosurg Psychiatry 2006;77:822–5.
. Idiopathic hyposmia as a preclinical sign of Parkinson’s disease. Ann Neurol 2004;56:173–81.
. Smell identification ability in twin pairs discordant for Parkinson’s disease. Mov Disord 2005;20:687–93.
. Clinical correlates of selective pathology in the amygdala of patients with Parkinson’s disease. Brain 2002;125:2431–45.
. The relevance of the Lewy body to the pathogenesis of idiopathic Parkinson’s disease. J Neurol Neurosurg Psychiatry 1988;51:745–52.
. Does this patient have Parkinson disease? JAMA 2003;289:347–53.
. The diagnosis of Parkinson’s disease. Lancet Neurol 2006;5:75–86.
. Diagnostic criteria for Parkinson disease. Arch Neurol 1999;56:33–9.
. A population perspective on diagnostic criteria for Parkinson’s disease. Neurology 1997;48:1277–81.
. What features improve the accuracy of clinical diagnosis in Parkinson’s disease: a clinicopathologic study. Neurology 1992;42:1142–6.
. Improved accuracy of clinical diagnosis of Lewy body Parkinson’s disease. Neurology 2001;57:1497–9.
. The evolution of diagnosis in early Parkinson disease. Arch Neurol 2000;57:369–72.
. Accuracy of diagnosis in patients with presumed Parkinson’s disease. Age Ageing 1999;28:99–102.
. Diabetes mellitus and progression of rigidity and gait disturbance in older persons. Neurology 2004;63:996–1001.
. Are Parkinson disease patients protected from some but not all cancers? Neurology 2007;69:1542–50.
. Basal ganglia cholinergic and dopaminergic function in progressive supranuclear palsy. Mov Disord 2007;22:1594–1600.
. Response to L-DOPA in multiple system atrophy. Clin Neuropharmacol 1993;16:139–44.
. Systematic review of acute levodopa and apomorphine challenge tests in the diagnosis of idiopathic Parkinson’s disease. J Neurol Neurosurg Psychiatry 2000;69:590–4.
. New developments of brain imaging for Parkinson’s disease and related disorders. Mov Disord 2006;21:2035–41.
. Striatal D2 receptor status in patients with Parkinson’s disease, striatonigral degeneration, and progressive supranuclear palsy, measured with 11C-raclopride and positron emission tomography. Ann Neurol 1992;31:184–92.
. [123I] beta-CIT/SPECT imaging demonstrates bilateral loss of dopamine transporters in hemi-Parkinson’s disease. Neurology 1996;46:231–7.
. Brain parenchyma sonography discriminates Parkinson’s disease and atypical parkinsonian syndromes. Neurology 2003;60:74–7.
. Midbrain sonography in patients with essential tremor. Mov Disord 2007;22:414–7.
. Estimated life expectancy of Parkinson's patients compared with the UK population. J Neurol Neurosurg Psychiatry 2007;78:1304–9. Patient consent: Patient consent has been received to publish the figures in this paper.